This pre-assembled product has 1 drive. Plextor duplicators offer exceptional value. All units are built in the UK using the highest quality components sourced from around the world. When you invest in a Plextor CD or DVD duplication system you can be confident you will receive a quality product, manufactured to the highest standard, at a great price. Plextor also offer unlimited technical support and advance swapout warranties *, offering you the peace of mind to get on with your production jobs. Plextor duplicators are now available in a stylish black and silver finish.Plextor tower duplicators are not only fast, but also reliable. Using the proven Plextor DVD recording and the fast 20X DVD-ROM for ripping, accuracy is assured. Copies can be made directly from the DVD-ROM or from the optional 160 GB hard drive (available on multidrive units). Sixteen 9Gb DVDs can be stored and kept ready for fast, simple copying.Plextor duplicators offer easy to use one click operation via 4 buttons and an LCD interface. The unit sets up in minutes, just plug into AC, load master into DVD-ROM and blanks into DVD Recorders then press ENT. Pressing just one button will copy from the DVD-ROM to the DVD Recorders. There is no complex operating system to learn. The four-button LCD display interface will guide the user through all procedures with no training necessary. 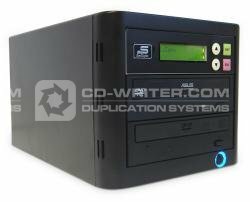 You do not have to be a computer user to operate the Plextor 1 DVD Duplicator system.All current DVD and CD formats with the exception of CD+G (Karaoke CD) can be copied. DVDs burn at a selectable 20x/16x/8x/4x/2x speed while CDs will burn at 32x/12x/8x/4x/2x. Exact image copies of original masters are assured and verified by the duplicators "Copy and Compare" feature. The duplicator also offers a "Test" function as well as a "Test and Copy" feature. The Source Input drive is also user selectable. The machine will also operate in simulation mode preventing the burning of corrupted discs. Once the disc copy process has been completed the copy will be verified before an audio alert is sounded to notify the user that the discs have burnt succesfully. We believe that Plextor tower duplication systems offer companies creative agencies government bodies and individuals an ideal entry level duplication system. Not only does the Plextor range offer exceptional value for money and the highest level of service but the company also offers an advance swapout warranty and unlimited technical support. What's more Plextor duplication systems offer the highest production output potential on the market. Remember automated isn't always better and burn for buck tower copiers win hands down every time. Plextor Burners are the best in the world bar none. They are especially good at making great copies on poor media. Roland VS series used to use them. I cannot express enough how good they are! Does anyone know if Plextor duplicators are any better than others on the market. My old boss always used to say Plextor burners were the best. Plextor . Duplicator . Premium . CD . DVD . with . 1 . drive . StorDigital . Systems .